Let me first of all wish all of you, all our faithful and our Religious a very happy Easter Season full of the choicest blessings of the Risen Saviour. It was heart-warming to learn from the Parishes that the “24 Hours for the Lord” event stipulated by the Holy Father for the Year of Mercy has been deeply spiritual experience for our faithful. Many Parish Priests informed me that the numbers of the parishioners who flocked to our Churches and Chapels was unpresidental. I wish to thank all of you for organizing this spiritual event during this Season of Lent by making our faithful aware of its importance as well as for providing them with the opportunity to make their Sacramental Confession. One Parish Priest has even recommended that the “24 Hours for the Lord” be made an annual feature in the Lenten Programme every year. We shall discuss the same in one of our forthcoming presbyteral meetings. I am also very happy that both the Diocesan and Religious Priests participated in the Chrism Mass in the Parish Church of Hatton and renewed their Priestly commitment. I wish to appeal to all of you to constantly remind our faithful about the importance of experiencing God’s unfathomable mercy in their lives. The Sacred Triduum made us profoundly conscious of the fact that Jesus our Saviour “being sinless, made Himself sin” for our sake and paid the ransom for the sins of mankind. In the Bull of Indiction” (Misericordiae Vultus) no 22 the Holy Father refers to the fact that this treasure of “indulgence” won for us by our Redeemer with the communion of Saints is available to us to pay the ransom for the wages of our sins. We must remind our faithful that God’s forgiveness knows no bounds. Therefore God forgives our sins and blots them out in the Sacrament of Reconciliation. And yet in the Pope’s own words “sin leaves a negative effect on the way we think and act”. By gaining indulgences the sinners are freed from every residue left by the consequences of sin, enabling him/her to strive towards the perfection of charity. Please explain to our faithful of the importance of going through the Holy Door with proper dispositions to gain indulgences. Each day those who walk through the Holy Door in the state of grace can gain one plenary indulgence. Now that the holy Week ceremonies are over. I hope that each one of you would take a few days off to rest. I am happy to announce that Deacon Devadas Stephen will be ordained a Priest on the 25th April 2016 at 3.00 p.m at our Cathedral. Deacon Dilan Perera is enthusiastically preparing himself for the language exam, after completing which he will have his Priestly Ordination. It will be announced in due time. Please keep our two Deacons in your prayers. With prayerful wishes I remain. Deacon Devadas John Stephen was born in 1985 and he is from Moolloya estate in Hewaheta Parish. He is the son of Mr & Mrs Masilamani Devadas and Sinnaiya Nesamani. He joined the Minor Seminary on 8th of January 2006. After that he entered the Inter-Mediate Seminary on 12th of November 2008.He started his Philosophical and Theological studies at the National Seminary on 2nd of October2009. 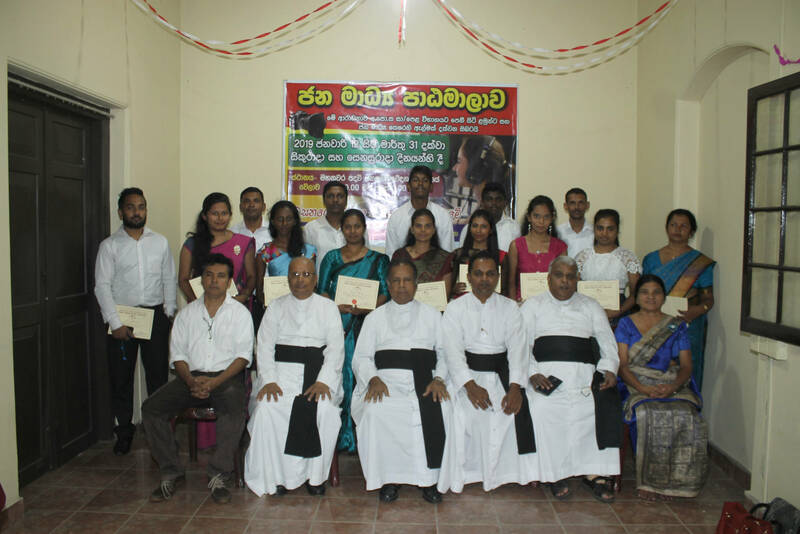 After formation at the National Seminary he was serving at the Parishes of Padiwatte and Nikewehara till his Diaconate. He was ordained a Deacon on 17th of October 2015 by His Eminence Malcolm Cardinal Ranjith. 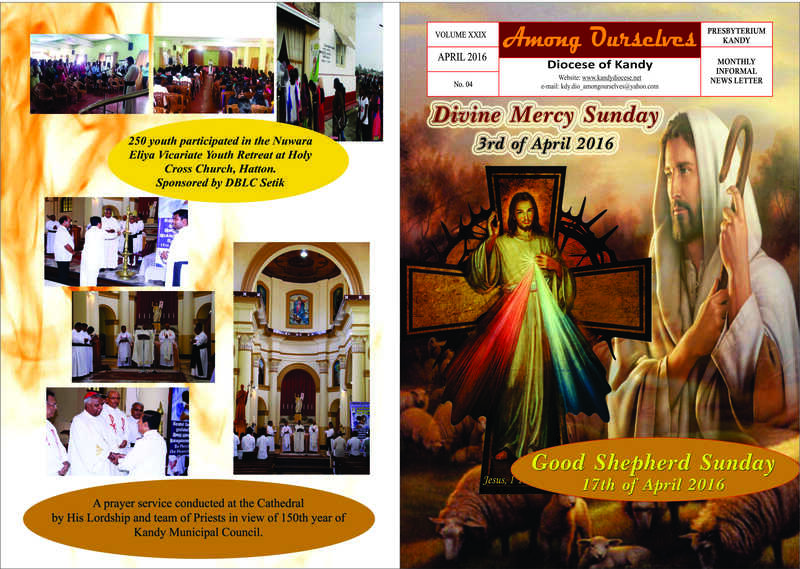 He practiced his Diaconal ministry in different parishes such as, Rotewewa and Nuware Eliya. He will be ordained a priest on the 25th of April 2016 at St. Anthony’s Cathedral, Kandy by His Lordship Rt. Rev. Dr. Joseph Vianney Fernando, Bishop of our Diocese. “The Church condemns sin because it has to relay the truth: ‘this is a sin’. , but on the other hand, at times, like to find a stick to beat others with, to condemn others. And Jesus has this message for us: mercy. I think — and I say it with humility — that this is the Lord’s most powerful message: mercy. Jesus’ attitude is striking: we do not hear the words of scorn; we do not hear words of condemnation, but only words of love, of mercy, which are an invitation to conversation. “Neither do I condemn you; go, and do not sin again.” Ah! Brothers and Sisters, God’s face is the face of a merciful father who is always patient. Have you thought about God’s patience, the patience He has with each one of us? That is His mercy. He always has patience, patience with us, He understands us, He waits for us, He does not tire of forgiving us if we are able to return to Him with a contrite heart. “Great is God’s mercy,” says the Psalm. Angelus on March 17, 20135. God’s mercy can make even the driest land become a garden; can restore life to dry bones (cf. Ez 37:1-14). … Let us be renewed by God’s mercy, let us be loved by Jesus, let us enable the power of his love to transform our lives too; and let us become agents of this mercy, channels through which God can water the earth, protect all creation and make justice and peace flourish. Together let us pray to the Virgin Mary that she helps us … to walk in faith and charity, ever trusting in the Lord’s mercy; He always awaits us, loves us, has pardoned us with His Blood and pardons us every time we go to Him to ask His forgiveness. Let us trust in His mercy! In today’s Gospel, the Apostle Thomas personally experiences this mercy of God. … Thomas does not believe it when the other Apostles tell him: “We have seen the Lord.” … And how does Jesus react? With patience: Jesus does not abandon Thomas in his stubborn unbelief … He does not close the door, He waits. And Thomas acknowledges his own poverty, his little faith. “My Lord and my God!”: with this simple yet faith-filled invocation, he responds to Jesus’ patience. He lets himself be enveloped by Divine Mercy; he sees it before his eyes, in the wounds of Christ’s hands and feet and in His open side, and he discovers trust. of Jesus who patiently, wordlessly, says to him: “Peter, don’t be afraid of your weakness, trust in Me.” Peter understands, he feels the loving gaze of Jesus and he weeps. How beautiful is this gaze of Jesus — how much tenderness is there! Brothers and sisters let us never lose trust in the patience and mercy of God! to meet him and embraces him with tenderness, the tenderness of God, without a word of reproach. … God is always waiting for us, He never grows tired. Jesus shows us this merciful patience of God so that we can regain confidence and hope — always! 10. God’s patience has to call forth in us the courage to return to Him, however many mistakes and sins there may be in our life. … It is there, in the wounds of Jesus, that we are truly secure; there we encounter the boundless love of His heart. Thomas understood this. Saint Bernard goes on to ask: But what can I count on? My own merits? No, “My merit is God’s mercy. I am by no means lacking merits as long as He is rich in mercy. If the mercies of the Lord are manifold, I too will abound in merits.” This is important: the courage to trust in Jesus’ mercy, to trust in His patience, to seek refuge always in the wounds of His love. Pope Francis has announced that the canonization ceremony of Blessed Mother Teresa of Calcutta will take place on Sept. 4 but the program will not include a papal visit to India. Pope Francis announced the date at a March 15 meeting of cardinals to give the final approval to several sainthood causes, including Mother Teresa. The Catholic nun who founded the Missionaries of Charity congregation, dedicating h her life for the “poorest of the poor” was based in the eastern Indian city of Calcutta, now known as Kolkata. Indian bishops during their plenary meeting in early March had formally sent an invitation to Pope Francis to visit India. During a discussion on inviting pope, some bishops had suggested that the pope’s visit be linked with the canonization ceremony. However, Cardinal Baselios Cleemis of Trivandrum, president of the Indian Catholic bishops’ conference told them that Vatican officials had informed him that Mother Teresa’s canonization ceremony will be in Rome. 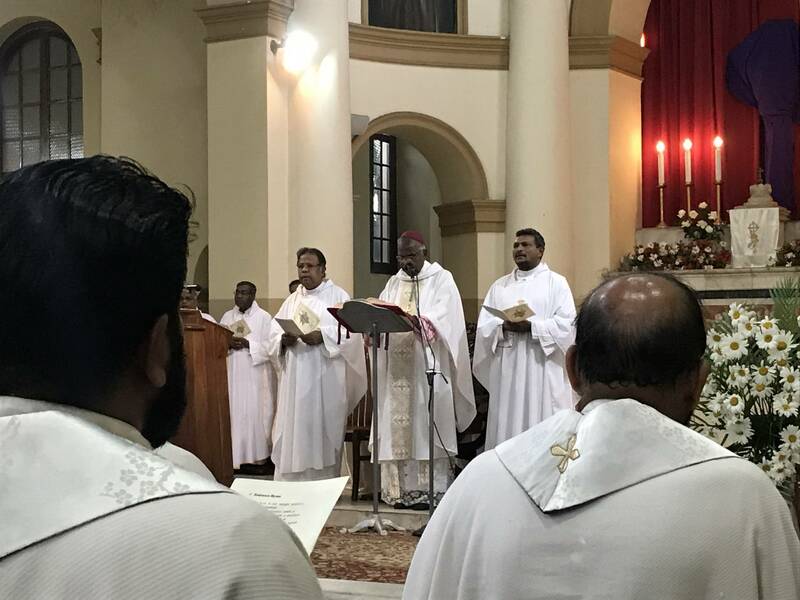 Father Joseph Chinnayan, deputy secretary general of the bishops conference, pointed out that two other canonization ceremonies of Indian Saints Kuriakose Chavara Elias and Alphonsa were conducted in Rome. Pope Francis cleared the path to Mother Teresa’s sainthood in December when he approved a second miracle attributed to her. Mother Teresa died of cardiac arrest at the congregation’s motherhouse in Kolkata on Sept. 5, 1997, aged 87. Her canonization process began two years afterward. Pope John Paul II beatified her in 2003. Her tomb at the motherhouse has become a pilgrimage center. With what firmness and power he uttered these words. The Jews had never before heard such words from human lips, and a convicting influence attended them; for it seemed that divinity flashed through humanity as Jesus said, “I and my Father are one.” The words of Christ were full of deep meaning as he put forth the claim that he and the Father were of one substance, possessing the same attributes. The Jews understood his meaning, there was no reason why they should misunderstand, and they took up stones to stone him. Jesus looked upon them calmly and unshrinking, and said, “Many good works have I showed you from my Father; for which of these works do ye stone me?” The Majesty of heaven stood, calmly assured, as a god before his adversaries Their scowling faces, their hands filled with stones, did not intimidate him. stones fall to the ground. His words had asserted his divinity, but now his personal presence, the light of his eye, the majesty of his attitude, bore witness to the fact that he was the beloved Son of God. Had the Pharisees misunderstood his words, he could and would have corrected their wrong impression. He could have told them that he was no blasphemer, although he had called himself the Son of God, and that his words need not necessarily mean that he had invested himself with divine prerogatives, and made himself equal with the Father. But he made no such statement. The impression they had received was the very impression he desired to make. Jesus answered them: “Is it not written in your law, I said, Ye are gods? If he called them gods, unto whom the word of God came, and the Scripture cannot be broken; say ye of Him, whom the Father hath sanctified, and sent into the world, Thou blasphemest; because I said, I am the Son of God? If I do not the works of my Father, believe me not. But if I do, though ye believe not me, believe the works; that ye may know, and believe, that the Father is in me, and I in him.” Again the hatred and the wrath is stirred within the breast of the Jews, and they sought “to take him; but he escaped out of their hand, and went away again beyond Jordan into the place where John at first baptized; and there he abode. And many resorted unto him, and said, John did no miracle; but all things that John spake of this man were true. And many believed on him there. We cannot give what we do not have. Experience God’s mercy first-hand. Do you have a difficult relationship with someone in your life? Share God’s mercy with someone. Try to practice Spiritual and corporal works of mercy. Pray the divine mercy novena daily. It does not have to be far. Find a shrine or a church which has the Holy Door of Mercy close by and spend extra time in prayer. Pray Pope Francis’ prayer for mercy daily. at the hands that once caressed them. The transplant surgery was performed by Dr Subramanian Iyer (right side next to Abdul Raheem) of the Amrita Hospital, Kerala. A Hindu doctor – a Christian organ-donor – a Muslim recipient – that’s humanity! In London there is a very large famous park, a public garden where, especially on Sundays, hundreds of people go to relax. In this park there was an area that is called “Hyde Park Corner” where every Sunday all those who desire may go to voice their opinions on philosophy, religion and other tropics. You could see groups of people gathered around these speakers listening, shouting, protesting and applauding. Now there was a man who Sunday after Sunday would go there just proclaiming that God did not exist. He was a very good speaker and so he was always challenging anyone to confront him in his ideas. But nobody dared to contradict him. Finally an old man presents himself. He went on to the podium near the speaker. At last speaker was very happy that he could make fun of this old man who dared to challenge him. No the only thing the old man did was taking an orange out of his pocket and very calmly began to peel it. What are you doing here? He asked him? “Just peeling an orange!” The old, an calmly answered.” And what do you mean by that? The old man did not answer but continued to peel his Orange. Then he began to eat it. Everyone was laughing at him but surely not the speaker. At last the old man turned to the atheist and asked him. “What does the Orange taste like? By the time speaker was very nervous, and angrily answered:” How could I know what the orange tastes like if you are the one who is eating it? The old man answered, that’s it, in the same way you cannot speak about God because you have never tasted him. So get down, and let me speak about God, and I have the right to do it and not you. the person God created and Jesus died for. With mercy comes new hope. When we love our enemy, we also hope that one day, they will return to the Lord. of hurt, hatred and resentment. Mercy will enable you also too see the other person in a new way, because mercy sees the hurt and anger but is gentle with it and brings comfort, thus allowing healing to begin. Love causes us to look differently at our enemies, with compassion and forgiveness. Love sees the good, love sees what is possible. Love facilitates forgiveness. The truth is that love and mercy go together. Mercy brings love and enables change to happen even when things seemed impossible. In this new light of God’s Love and Mercy, the person who we called “enemy” is more than what is negative, more than just badness and hatred. That’s why Jesus was slow to judge His enemies. On the Cross, Jesus spoke to the Father and said ‘Father, forgive them, for they know not what they do’. When we show mercy to someone, we give that person dignity. We remind them that we see in them more than just their badness. When we are merciful towards our enemies, God’s love flows through us; it changes and transforms us and them. Mrs.Clive Taylor a former member of the chancery office passed away peacefully on 8th of March 2016 at home. She was buried at the catholic cemetery of St. Thresa’s Church, Peradeniya. Mrs. Taylor had served many years both at social action centre in the early 1970s.later over 3 decades in our chancery office. She was always willing and dedicated worker. Her contribution to promote the cause of beatification and canonization of our beloved Apostle, St. Joseph Vaz has been significant. She had a great love for the Diocese and Priests whom she always considered as her own children. We thank God for the service for the Diocese, and we pray that the lord may grant her eternal peace in his Kingdom.